I did thoroughly enjoy the Annual General Meeting. 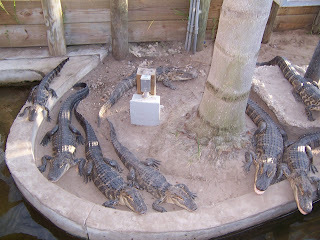 (As you can see from the picture of the Woodville family, who were housed across the street at a mini-golf course, we were in the heart of Tacky Tourism Country. 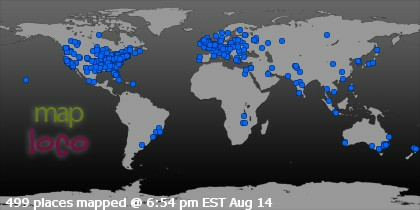 That's only half of the Woodvilles, by the way--more were outside the picture.) We heard a very interesting theory that William Catesby, not Bishop Stillington, revealed the supposed precontract to Richard, Duke of Gloucester, enjoyed a presentation about Oxford University during the Wars of the Roses, were serenaded by several types of recorders, and had a visit from the Lincoln Company, a living history group that brought an impressive collection of reproduction armor and weapons for us to examine, including those in the picture above. 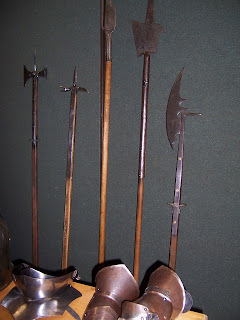 As a writer who had to send one of my characters into battle, I found the last presentation particularly helpful for visualizing how he would have had to fight. In short, I was left with lots to think about, and I'm glad I went. I got a couple of books read on the flights to and fro, and I'll be posting reviews in due course. Now, back to work! I'm off this weekend to the Richard III Society American Branch's annual general meeting, held this year in Orlando, Florida. Since I diss the man so much on this blog, you might be surprised to hear that I'm a member, but it's a great organization for anyone interested in Richard III and the Wars of the Roses. The publications in particular are a treasure trove for anyone doing research into the period. Speaking of Richard III, I was on my way to fetch said daughter from school the day before yesterday (I should have worn my hennin and really embarrassed her) when I spotted a mini-bus with the name "King Richard Transportation Service" on it. My first thought was that America had turned into a monarchy without anyone informing me, which would certainly explain a few things about the past eight years. My second thought was no, someone just liked King Richard, but which King Richard? I don't really associate any of the three with transportation, but let's face it, there's something a little sinister about Richard III transporting people, given his tendency to, er, lose them. Especially if they're children, which I assumed were the intended passengers here, since this was the time of day for taking them to and from school. In this I turned out to be wrong, however, for when I got home I Googled and discovered that the company is in the business of transporting the elderly. Which is even more odd, since none of the Richards lived to a ripe old age. So the mystery lives on: which King Richard gave his name to these buses? While you're pondering this, I'm off to Florida, hennin and all. If I come back and start pontificating on how everything in England would have been perfect if it hadn't been for those upstart Woodvilles, you'll know someone slipped something into my drink down there. Jacquetta Woodville was the daughter of Pierre of Luxembourg, Count of St. Pol (d. 1433), and Marguerite de Baux of Andria. Her uncle, Louis de Luxembourg, was bishop of Thérouanne and chancellor of France during the time that John, Duke of Bedford, was serving as Regent of France for the government of the youthful Henry VI. Another uncle, Jean de Luxembourg, is known for having held Joan of Arc in captivity before she was handed over to the English. Following childbirth, it was customary for a medieval woman to seclude herself for a period, after which she would attend church for a ceremony of purification. A celebration often followed. At the banquet following Elizabeth Woodville’s "churching," a Bohemian observer noted that Jacquetta knelt before her daughter, being bidden at times to rise. This has been taken as proof of Elizabeth Woodville’s insufferable haughtiness—even her own mother had to kneel before her!—but there is no indication that Jacquetta found this demeaning or that this highly formal occasion was typical of the daily interaction between mother and daughter. For all we know—and we don’t—Jacquetta might have insisted that her daughter observe all the formalities of what was her first churching as queen. Wedding Bell Research Blues: A September Anniversary for Edward IV and Elizabeth Woodville? It’s generally stated that Edward IV and Elizabeth Woodville were secretly married on May 1, 1464. But is this their actual wedding date? It’s been noted by several authors that as late as April 13, 1464, Elizabeth and William, Lord Hastings, Edward IV’s close friend and chamberlain, entered into an agreement whereby one of William’s as-yet-unborn daughters would marry Elizabeth’s eldest son, Thomas. William and Elizabeth were to share in the profits of Elizabeth’s Grey lands, which she had apparently enlisted William’s help in recovering. Because Elizabeth would have hardly needed to enter into such an agreement if she knew she was shortly to be the wife of Edward IV, it’s generally assumed that at this point, neither Elizabeth nor Hastings knew that a royal marriage for Elizabeth was in the works. Less well known, however, is the sequel to this agreement: a grant dated August 10, 1464, in which Edward IV gives William Hastings the wardship and marriage of Thomas Grey. As far as I know, only Michael Hicks in his book Edward V notes the existence of this grant, which can be found in the National Archives at DL 37/33, entry no. 28. (I have a transciption of it at hand.) As Hicks points out, if Elizabeth had married Edward IV in May, why would Edward IV subsequently grant her eldest son’s wardship and marriage to Hastings? Indeed, after Edward IV’s marriage was made public, a marriage for Thomas was arranged that was far more lucrative than the planned Hastings match the August grant appears to have been made to further. One could argue that Edward IV made the grant as part of a ruse to hide his marriage from even his closest friend, but it seems rather more likely that he at this point had not yet married Thomas Grey’s mother. Hicks notes another piece of evidence of a later marriage date: on August 30, 1464, Edward IV granted the lordship of Chester, traditionally reserved for the heir to the throne, to his younger brother Clarence. Would Edward had made such a grant had he been already married to a woman who could be hoped to give him an heir? Neither of these grants prove that a May 1, 1464, wedding didn’t take place, and it could be argued that there had been a wedding on May 1 but that Edward IV as of August had not yet decided to come clean about it. Still, they do serve as a reminder that as with so many things about this period in history, the May 1 date (described by Ricardian writer Annette Carson as “beyond dispute”) is open to question; moreover, as David Baldwin notes in his biography of Elizabeth Woodville, the idea of the May wedding might have been “borrowed from romantic tradition,” or it might have arisen due to confusion with Elizabeth’s May coronation the following year. Even if the May 1 date is a romantic fiction, it doesn’t make much difference in the grand scheme of things. Still, a wedding date after August 30, 1464, does give rise to two considerations. First, since Edward IV revealed the wedding to his council in September 1464 and presented his new bride to his council on September 29, 1464, a marriage date after August 30 means that the wedding was kept secret for less than a month, which undermines the argument that Edward had dishonorable intentions of never making his marriage public. Second, those who have accepted the claim of Richard III that the marriage was procured by sorcery on the part of Elizabeth and/or her mother have gleefully pointed out that May 1 was the day after Walpurgisnacht, a Grand Sabbath of the witching year and thus an apt night for Elizabeth, Jacquetta, and their witchy ilk to cast spells upon the hapless Edward IV. One Ricardian, W. E. Hampton, in “Witchcraft and the Sons of York” (The Ricardian, March 1980) posits that Edward IV’s fatigue at Stony Stratford after the wedding, as described by the chronicler Fabian, can be attributed to “the orgiastic nature of the rites to which he may have been introduced” at a wild Walpurgisnacht in the forest of Grafton. While a September wedding could still have been procured by witchcraft, of course, the accusation loses a bit of its punch without Walpurgisnacht to lean upon. If the couple did marry after August 30, they could have at least done Richard the courtesy of waiting until All Hallows’ Eve. Sourcebooks has been reissuing a number of historical novels, including two classics by Margaret Campbell Barnes about two of historical fiction's perennial favorites: Henry VIII's wives. Brief Gaudy Hour is about Anne Boleyn; My Lady of Cleves about Anne of Cleves. I was pleased to be sent review copies of the two reissued Barnes novels. My Lady of Cleves was published in 1946; it contains a dedication to “the women who lost the men they loved in the fight for freedom.” For a sixty-year-old historical novel, it’s held up remarkably well. Barnes's prose is uncluttered and easy to read, nothing purple or fusty about it. Barnes’s characterization of Anne of Cleves is interesting and refreshing. Though there doesn’t seem to be much reason, historically, to take Henry VIII at his word in describing her as a “Flanders mare,” she’s often treated as such by novelists. Here, Anne is attractive, though not in the style that appeals to Henry, and she’s even given romantic yearnings for none other than Hans Holbein. How accurate this is I have no idea, but as the relationship isn’t depicted as having an effect on history or as giving rise to any offspring, I can live with it. Anne’s a capable woman who longs for children of her own and who satisfies her maternal instincts by mothering Henry’s brood. At the same time, she’s no saint; jealous of Hans Holbein’s mistress at one point, she takes the opportunity to sleep with Henry VIII, now on his fifth wife. 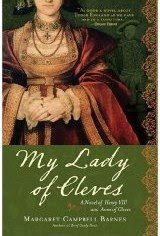 My Lady of Cleves is an appealing story of a woman who makes the best of a bad situation. As she has been relatively neglected by historical novelists, it's nice to see this novel in particular being reissued. 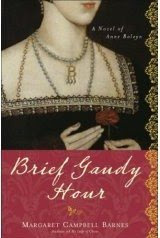 Brief Gaudy Hour, which I first read in the reissued version, tells the much more familiar story of Anne Boleyn. Originally published in 1949, it too doesn't show its age, but can hold its own--and then some--against any of the numerous historical novels about Anne Boleyn that have been published in the past few decades. Barnes concentrates on the psychological aspect of Anne's story, which here spans the period from her service with Henry VIII's sister to her death on the scaffold. Anne's thwarted relationship with young Henry Percy is especially well done, as is her developing, then deteriorating relationship with the king. If you're one of the few people on earth who hasn't read a historical novel about Anne Boleyn, this one would be an excellent one to start with; if you've read many novels about the queen, this one is a worthy addition to your list. Each reissued novel comes with a reading group guide prepared by Barnes's great-granddaughter. Let's hope some more of her books will be re-released! 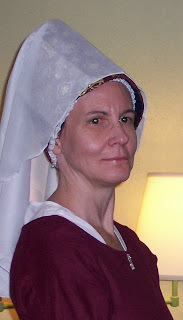 A busy weekend lies ahead, and I'm still working on a long blog post about Jacquetta Woodville, Elizabeth Woodville's mother, so I'll leave you for the week with several reviews I did for the August Historical Novels Review. Two of the reviews, you'll see, were for nonfiction. I enjoyed all three of these books, but I heartily recommend the Mary Tudor biography. It’s 1882, and Maggie Newcomb, just turned eighteen, is determined to win handsome Colby Stoddard for her husband—if, that is, she can keep him from being snared by beautiful Tamara Brennan, who’s visiting Maggie’s small Oregon town following a broken engagement. When Evan Parker, newly graduated from Harvard Law School, returns to his family in Maintown, Maggie sees the perfect opportunity. Not only can the awkward young lawyer defend Maggie’s friend Tommy against murder charges, he can join forces with Maggie to keep Colby and Tamara apart. The second book in Pella’s Patchwork Circle series, which revolves around the members of a quilting circle and their daughters, Sister’s Choice is a charming and often gently humorous novel, with engaging characters, especially its heroine, who’s refreshingly blundering and down-to-earth. It also features that rarity in romantic novels—a bespectacled hero. I look forward to spending more time with these characters. Lancaster Against York has a somewhat misleading subtitle: this is a study of the Wars of the Roses, certainly, but not an assessment of their influence on modern Britain. Subtitle aside, this is a well written and engrossing history of this turbulent time by an author without an axe to grind on behalf of either side. There are a few irritating errors here—Richard III did not imprison the young Earl of Warwick in the Tower, for instance. Occasionally, too, Royle seems unaware of recent research, such as the discovery of a dispensation for the marriage of the Duke of Gloucester and Anne Neville. There are no annotations, which I found frustrating when I wanted to check a source, but there’s a useful bibliography and a helpful section listing the key players of the time. On the positive side, Royle packs a great deal of information from a wide range of sources into a relatively short space, and his assessments are fair and balanced. For those wanting an introduction to the Wars of the Roses, as well as for those wanting to refresh their general knowledge, this will be a useful book. If any historical figure is due for a reassessment, it’s surely Mary Tudor, characterized alternatively as a bloodthirsty fanatic and as a pathetic hag. In this lucid and intelligently written biography, Porter does an admirable job of showing us the woman behind the myth. Porter gives us a full picture of Mary, reminding us that the queen who is often regarded as dour and sickly enjoyed fine clothes, gambling, and hunting. Her religious persecutions are not glossed over, but are placed in the context of their time and in that of Mary’s more positive actions regarding religion. Especially interesting is Porter’s examination of Mary’s fraught and highly ambivalent relationship with her younger sister. It is not the “Bloody” Mary of popular history, or the lonely wife familiar from historical fiction, who emerges here, but the courageous woman who fought through many obstacles to get to the throne, then to stay there. Porter is to be commended for bringing this complex and much-maligned woman to life. As I work on a long post planned for later this month, I wanted to quickly mention a couple of things. First, Julie Rose was nice enough to interview me for her blog, Writers and Their Soundtracks. Take a look (and a listen)! And thanks, Julie! Brady never falls into the vice of judging Martha Washington by twenty-first-century standards; she doesn't condemn Martha for not holding modern views about slavery, for instance, and she doesn't turn her devotion to her husband and to her family into a saga of male oppression. Instead, she reminds us of Martha's fortitude amid heartbreaking losses (all of her children by her first marriage predeceased her), her husband George's evident respect and admiration for her, and the courage she displayed during the turbulent times of the American Revolution. At the same time, Brady shows us a side of Martha that's left out of American schoolbooks: her business acumen, grit, and charm. This biography, in short, is well worth reading for those interested in American history and/or the role of women in history. Give it a go this election season. If banning books is one of the first things Palin as a small-town mayor would try to accomplish, what do you think she would get up to if she ended up as President? Scary, very scary.